A few weeks ago I was talking to my business coach and we got on the subject of horseback riding — when and how I got interested in it. I’ve always loved horses, but did not get my first horse until 13 years ago, and that was Gypsy who is retired now, but I still have her. Anyway, our conversation got me thinking about my experiences around horseback riding and I thought about my very first time on a trail ride and on a horse that wasn’t being led by someone else! It was late winter/early spring in Indiana, and I was a pre-teen (I think). The horses hadn’t been ridden all winter and were very fresh and excited to be out of the barn! 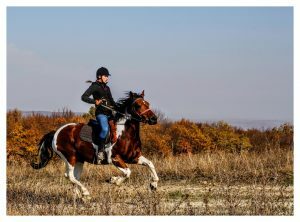 We were riding along nicely in an open field when the horse I was riding took off full speed ahead — running and heading towards the edge of the woods. He did not want to slow down, and I didn’t know enough to get him slowed down. All I could do was hang on and duck (to keep from getting knocked off by a low hanging branch)! One of the adults riding caught up to us, grabbed my reigns and got us stopped. We then made the plan that I would stay behind everybody else to keep my horse from running away again! As entrepreneurs, we often find ourselves running full speed ahead — hanging on and ducking — with no strategy in place. Have you ever gotten what you thought was a brilliant idea for a new program offering? Of course you have! And then did you proceed full speed ahead creating the program? Maybe! Sometimes you end up spending all that time, energy and money creating a program that your target market doesn’t want. You have zero sales. And now you have a program that nobody is interested in. Is it that nobody is interested or was the messaging wrong? How do you know? Before creating your next latest and greatest program, go talk to your list. Talk to your existing clients and get their feedback on the struggles they’re having and the solutions they’re looking for. What would appeal to them? Continue talking to others who are not your clients, but who are your ideal clients. Now that you have this information, create your outline for the new program. If it’s a program that you’ll drip content out or do weekly calls, don’t do the whole thing just yet. Get ahead a little and create the first lesson or two, and then sell it! Don’t spend time creating the entire program until you absolutely know it will sell. Another common way entrepreneurs run full speed ahead is by not having the right team in place. One person cannot do it all for very long, no matter how motivated or equipped he or she is. When solopreneurs have success and the company begins to grow, they can run full speed ahead and hang on for a short while, ducking here and there and enjoying the windfall. But eventually, things will start to fall apart because there is not a support team in place to help hold the reigns and keep things balanced and stable. However, if the right team is in place from the beginning, the success still comes (and it can come quickly), but the difference is you’ve got a group of skilled people holding things together, complimenting each other’s strengths, and ensuring that the business keeps up with and grows along with the market demand. What are some ways that you may be running full speed ahead in your business? It may be time to slow down a bit to think about how you can regroup to ensure your business is not only profitable but also balanced and organized in the New Year.